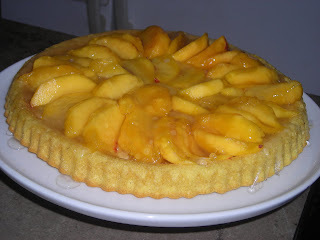 With the last of the peaches, we dusted off an old recipe and made a German Torten. Although, German by heritage, this recipe does not come from my family but rather from our first friends we had as a couple. This couple right after their marriage ended up in the Air Force and ended up in Germany. She found this recipe while they lived there, loved it, and served it to us the first time we had dinner at their house. I loved the dessert so much that I begged for the recipe which she kindly shared. I still have her handwritten note card with the recipe. For the cake you need a special pan and a special glaze. That cake pan was the first special equipment I ever bought for my kitchen. Although I don't make the torten every year, the pan has survived every time I ruthlessly cleaned the kitchen cupboards. I try to keep a package or two of the glaze in the pantry in case I want to make the torten. 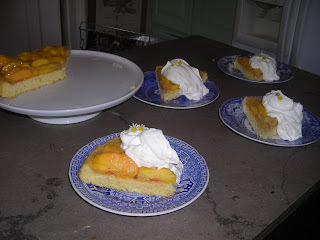 Friend Diane made it with peaches and so do I. I've not tried it with any other fruit although the recipe calls for "fruit" and not peaches. If you buy the glaze, I would assume that the cake portion COULD be made in a regular pie plate, however, there would not be the lip around the edge to hold in the fruit. It's a simple recipe and like so many European desserts not all that sweet. After an absence of several years, it was nice to have the torten for dessert. Like welcoming an old friend back to the table. Mix sugar eggs and vanilla until creamy. Add dry ingredients and mix well. Pour into greased (buttered) torten pan and bake at 350 for 30 min. Remove from pan immdiately onto serving plate. Allow to cool completely. 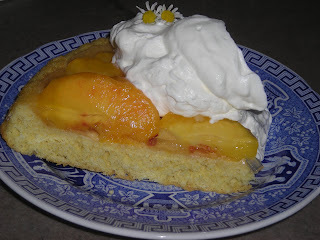 Arrange fruit on torte, pour filling over fruit and let set until serving time. Heat juice or water, then add sugar and cake glaze which has been mixed together. Cook until thickened. Pour over fruit and torte. Let set untl serving time. Top with whipped cream. but will remedy that post haste.